Slow Hands & Tanner Ross are set to reveal the sonic alchemy that's been bubbling away since the pair first got their production juices flowing poolside, piña colada style last summer. A definitive slice of heady, bittersweet house 'All The Same' is the first gem to drop from their forthcoming collaborative album and includes a mighty remix from The Bamboozla aka Eli Soul Clap and Baby Prince. 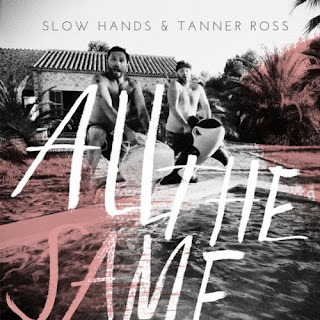 Meeting at the DEMF in 2010, it was love at first sight for Tanner Ross and Ryan Cavannah aka Slow Hands. Ending up together at a party and sharing the booth, they've been pretty tight ever since. When the whole W+L crew decided to make Majorca their base for the summer season 2011, the pair ended up spending a fruitful few weeks writing real songs for the dancefloor, and racing on giant inflatables. A duo of undeniable talent, it's about time Slow Hands and Tanner invade your ears and make your souls sing. First taste 'All The Same' is a sultry bittersweet refrain set against rolling drumbeats, and skittish snares encased in undulating waves of melody and hazy synth keys. The Bamboozla and Baby Prince take this glorious track and rework it for a more driving dancefloor, increasing the stomp and tempo, while the 'Jah Bless Reggae Mix' (a version for the album), plucks a soft reggae riff and slow things down to a languid, dubby drawl.